Collecting essays from prominent scholars who span the globe and academic disciplines, Practicing with Paul speaks into the life of the church in ways that inspire and edify followers and ministers of Jesus Christ. Each contribution delves into the details and historical contexts of Paul's letters, including the interpretation of those texts throughout church history. Meanwhile, each author interprets those details in relation to Christian practice and suggests implications for contemporary Christian ministry that flow out of this rich interpretive process. By modeling forms of interpretation that are practically-oriented, this book provides inspiration for current and future Christian ministers as they too attempt to incarnate the ways of Christ along with Paul. ""As the title promises, the essays here draw, even compel, the reader into Pauline 'practice, ' that is to say, into engagement with the Pauline gospel as it informs contemporary Christian ministries of transformation, justice, and peace-making. The essays span a distinguished, intergenerational company of authors whose work is informed and enriched by Susan Eastman's extraordinary, generous, and generative gift for showing how careful Pauline exegesis speaks to the most urgent concerns of our times."" --Alexandra Brown, Washington and Lee University Presian R. Burroughs is Assistant Professor of New Testament at United Theological Seminary in Dayton, Ohio. In addition to Pauline scholarship, her research interests include ecological theology. 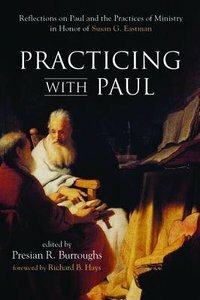 About "Practicing With Paul: Reflections on Paul and the Practices of Ministry in Honor of Susan G Eastman"